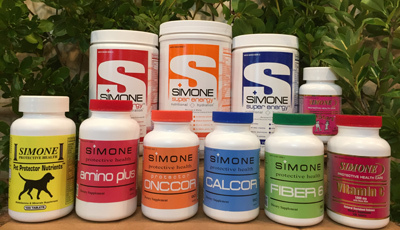 Lawrenceville, NJ (Dr Simone) – Against the background of ever-upward-spiraling healthcare costs, we have seen surprisingly little progress in combating major diseases. Our primary focus on treatment, with minimal attention to prevention, has created a cost explosive situation that will continue to grow exponentially. Our losing war against cancer illuminates this grave challenge. Despite the hundreds of billions of dollars that have been spent on cancer research and treatment, the number of new cases of every form of cancer has increased. Despite all of our current treatments and technology, lifespans for persons afflicted with almost every form of adult cancer have remained constant – which means, tragically, that there has been no significant progress in the treatment of adult cancer. These and other CONTROLLABLE risk factors account for 95% of all cancers and heart diseases. 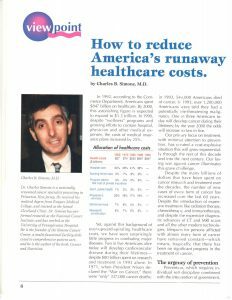 Yet this continuing de-emphasis on causative factors, with a growing emphasis on treatment, is the root contradiction in American life that must be addressed before healthcare costs can be contained. About 90% to 95% of all chronic illnesses are preventable. The logic that should follow this transcendent fact stares us in the face: Healthcare costs can be reduced and not just contained if people elect to modify their risk factors. This is a process that can come into being through individual behavior along with courageous initiatives by the federal government. 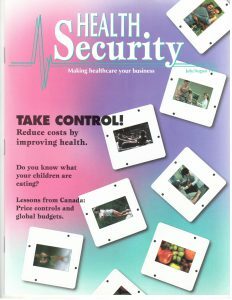 In 1994 I outlined many of these broad issues (published in Health Security) that still hold true that must be addressed if we as a nation seriously wish to contain and reduce healthcare costs. This program needs to be expanded across the United States. Consuming the correct amount of PROTEIN and from the proper source is healthier and less expensive than consuming fast food protein or less healthy protein sources. Employees pay an increased portion of health insurance premiums AND can voluntarily participate in a patented program that quantifies costs for controllable risk factors that they can modify and thereby pay less, or take personal responsibility for the increased cost attributable to the risk factors by paying more for insurance. People feel twice as bad about losing $100 compared to feeling good about winning $100. 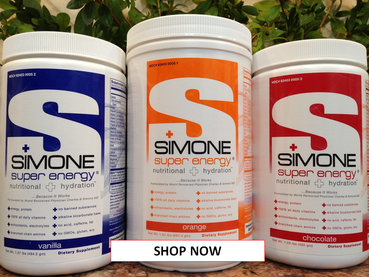 Our Program uses a monthly financial incentive to encourage long lasting health. By 2050 the world’s population is predicted to be 9 billion people and crop yields must increase by 50%. The global market supplies most of the world’s food supply and relies on three crops: corn (maize), wheat, and rice. Most of this goes to feed livestock. 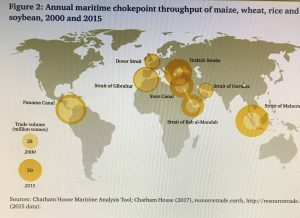 The publication called Chokepoints and Vulnerabilities in Global Food Trade by the Chatham House shows that the global food system relies on getting through 14 chokepoints like the Panama Canal, Suez Canal, Black Sea ports, Strait of Hormuz, US inland waterways and rail network, and Brazil’s road network. 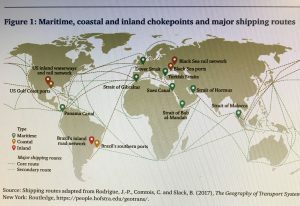 These chokepoints are subject to weather, war, piracy, and other vulnerabilities. Healthy foods result in better health outcomes and lower carbon production. However, the current world’s population has demanded a more westernized diet that dramatically increases the risk for cancer and other chronic diseases: high in meat, cheese, processed foods, high in sugar and saturated fats, and low in fiber. 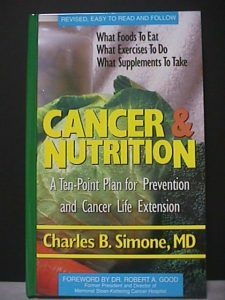 This was the subject of our first book in 1980, Cancer and Nutrition. When people take personal responsibility for their health by eating low-fat, low sugar, high-fiber foods, their health will improve, there will be less risk for war and piracy because there will be less demand for these foods, and the carbon footprint can be reduced by 30% because there will be a reduction in the consumption of meat and cheese and hence a reduction in the production of a major greenhouse gas, methane. Greenhouse gases warm the atmosphere and include water vapor, carbon dioxide, methane, nitrous oxide, and ozone. Carbon dioxide has been considered to be the leading cause of global warming but methane is 25 to 30 times more potent than carbon dioxide as a greenhouse gas. Methane rises into the air, reacts with hydroxyl radical to form water vapor and carbon dioxide. Methane’s lifespan in the atmosphere is about 9.6 years. The U.S. Food and Agriculture Organization says that methane output could increase by 60 percent by 2030 [Source: Times Online]. Cows and other Grazing Animals – Globally there are about 1.5 billion cows (65% are in India, Brazil, and China) and billions of other grazing animals that emit massive amounts of methane through belching, with a lesser amount through flatulence. Two-thirds of all ammonia comes from cows. The release of about 100 kg methane per year for each cow is equivalent to about 2,500 kg carbon dioxide per year. Some experts say the average dairy cow expels 100 liters to 200 liters a day (or about 26 gallons to about 53 gallons), while others say it’s up to 500 liters (about 132 gallons) a day. In any case, that’s a lot of methane, an amount comparable to the pollution produced by a car in a day. Termites globally produce about 20 million tons of methane each year. Landfills are the third largest source of methane in the United States. Thawing Permafrost releases equal amounts of carbon dioxide and methane that come from decomposing dead animals and plants. Water-saturated permafrost soils without oxygen can be twice as harmful to the climate as dry soils because methane is 25 to 30 times more potent than carbon dioxide as a greenhouse gas. The government must intervene to encourage a healthy diet which therefore will decrease the demand for meats, fats, and sugar, and increase the consumption of high fiber foods. Stop Big Pharma companies from receiving exclusivity and tax discounts under the auspices of the US Orphan Drug Act (ODA) of 1983 and Defense Advanced Research Projects Agency (DARPA) for developing narrowly targeted treatments for cancers instead of neglected diseases for which these programs were intended. 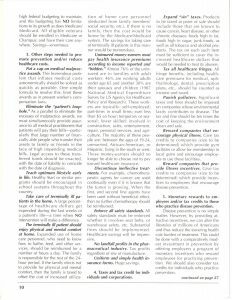 Stop “gag-order” clauses – The pharmacist must tell the patient if a generic equivalent drug is less expensive than paying for a prescription using insurance. Stop higher costs for mail order drugs – Medicare/Medicaid found that more than a third of the mail order drugs cost more than if you went into a pharmacy. 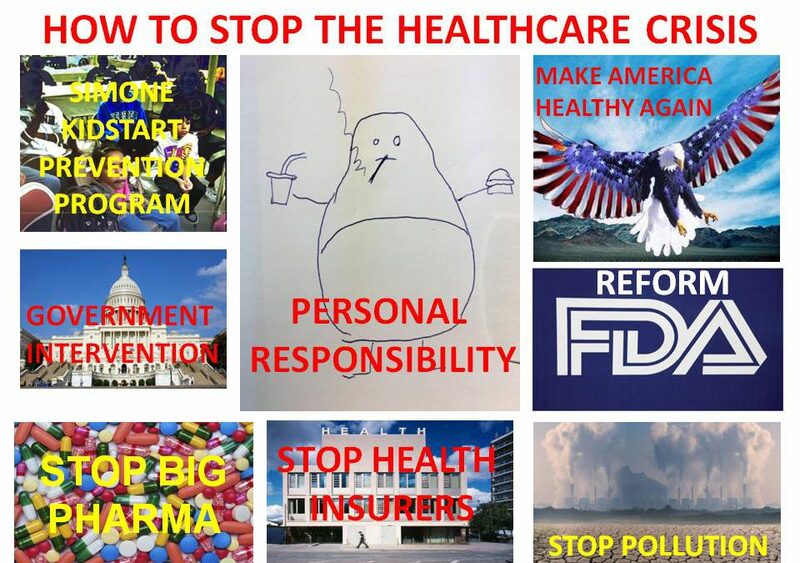 Stop Big Pharma from using the Citizen-Petition Pathway that allows Big Pharma to delay competition that, for even a few months, can generate millions of dollars. This Citizen-Petition Pathway was started in the 1970s by the FDA to allow the ordinary citizen to voice his/her concerns about a drug. But in recent years, the majority of the “concerned citizens” turn out to be Big Pharma companies invoking frivolous or questionable claims to delay generic drug competition. Open free markets to hospital development and stop hospital monopolies. Prohibit any federal government employee (FDA, DEA, etc) from ever working for Big Pharma or its distributors in ANY capacity. Prohibit ANY complicit activity of a federal employee with Big Pharma. Approve effective treatments that extend life. Drugs that decrease a blood level of something like hepatitis C virus for instance has been shown not to extend life or improve the quality of life. 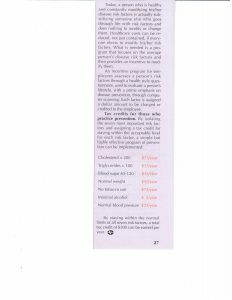 Cost for 12 week treatment of hepatitis C: $96,000 in USA; $77,000 in United Kingdom; $78 in India – that’s right seventy-eight dollars. Prohibit any FDA employee from ever working for Big Pharma in ANY capacity. Prohibit ANY complicit activity of an FDA employee with Big Pharma. Tax big Pharma regardless of site of incorporation or of site of manufacture etc. THE TRUTH ABOUT CANCER This interview was done in 1996. UNFORTUNATELY, THE INFORMATION IS TIMELESS – BOTH THE TRUTH ABOUT CANCER and THE CONFLICT OF INTEREST BETWEEN BIG PHARMA AND SOME CANCER CENTERS AND SOME PHYSICIANS. BIG PHARMA MASK HIGH DRUG PRICES BY DONATING TO CO-PAY GROUPS – For every $1 million donated by Big Pharma to help patients get high priced drugs, $21 million can be generated back to Big Pharma. PATIENT-ASSISTANCE PROGRAMS – BIG PROFITS FOR BIG PHARMA Patient-assistance programs effectively: (1) increase demand for the drug, (2) allow companies to charge higher prices and thereby gain higher profits, and, (3) enjoy tremendous public-relations benefits. BIG PHARMA RAISE PRICES USING TRICKERY Big Pharma raise prices each year, or when a new indication is granted by the FDA, or by trickery: Change the dose per unit sold forcing a higher price even though that dose is not needed. LOW LDL DOES NOT PROTECT, BUT BIG PHARMA AND HARVARD SAY YES Amgen, the maker of evolocumab (Repatha) funded the research, paid EVERY author on the paper, led by Harvard researchers, and the findings were published in the prestigious New England Journal of Medicine May 4, 2017. If you take the drug, evolocumab (Repatha), your LDL will go down but you won’t live any longer. IT’S ALL ABOUT INFLAMMATION AND OXIDATION. BIG PHARMA AND FEDS BLOCKS GENERIC CANCER DRUGS Big Pharma uses several tactics: Pay-for-Delay, Product Hopping, no importation of prescription drugs. FEDS LET BIG PHARMA LEGALLY LOOT AMERICAN TAXPAYERS Big Pharma can dodge paying their fair share of taxes while enjoying aggressively priced products in the United States. The U.S. Government has always protected Big Pharma. BIG PHARMA INFLUENCES GOVERNMENT AND COULD HARM AMERICANS – The 21st CENTURY CURES ACT – would get drugs and devices approved with fewer patients, shorter times, and require the FDA to use nontraditional study designs; give hospitals a financial bonus for administering costly new but unproven antibiotics; allows a medical device maker to pay a third-party to assess its own product. GOVERNMENT INTRUSION SOARS CANCER COSTS FOR YOU The federal government, the biggest payer of cancer care, made cancer costs soar because Medicare pays an extra $6500 a year when chemotherapy is given to a patient in a hospital owned facility. Private insurers also pay a higher premium for care delivered in a hospital setting. The costs will keep spiraling upward because of Government intrusion and clever lobbyists, forcing cancer patients from private practitioners to hospital owned facilities incurring much higher costs. 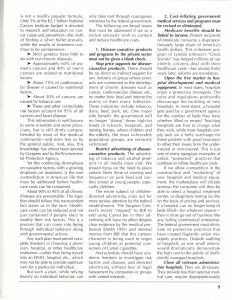 All types of pollution have been written by me in Cancer and Nutrition. HOW TO STOP CLIMATE CHANGE: COWS, TERMITES, LANDFILLS, PERMAFROST A healthy diet will decrease diseases, decrease carbon footprint by about 30%, and decrease the risk of war and piracy. Carbon dioxide has been considered to be the leading cause of global warming but methane is 25 to 30 times more potent than carbon dioxide as a greenhouse gas. Therefore, even though governments and Nobel Laureates focus on carbon taxes, the real emphasis should be on minimizing and eliminating methane sources rather than focusing on burning of fossil fuels like coal, oil and natural gas. Air pollution kills and hardest hit are racial minorities and people with low income (Qian MS et al. NEJM. 2017; 376:2513-22). Asbestos, diesel exhaust, acid rain, ozone, CPUs, UVB light, radon. Water pollution: synthetic organic chemicals, chlorination, some inorganic chemicals, etc. Radioactive material, electromagnetic radiation, etc. (c) 2018 Charles B Simone, M.MS., M.D.